Hey guys! I really wanted to share my latest salmon recipe with you, but the pictures weren’t up to par. I went to edit them last night and decided that they need to be re-done. 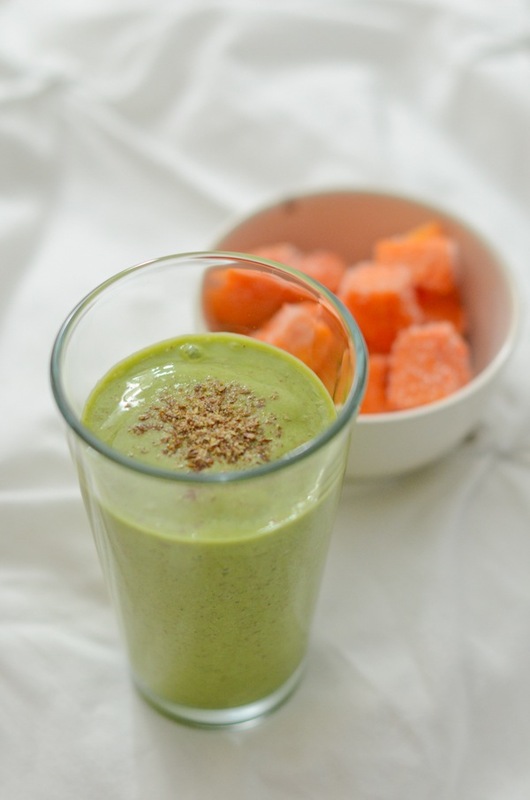 So, instead I’ll give you this: Papaya Power Green Smoothie Recipe. The weather is finally warming up here in NYC, and hopefully it’s nice where you are too. Not sure about you, but warm weather makes me think smoothies. As you guys know from my other papaya smoothie recipe, I tend to have a good amount of frozen papaya on hand. Seriously, if your papaya is about to go bad, just freeze cut pieces and make a smoothie. The only thing I’ve found works well with frozen papaya is making smoothies. Many people enjoy smoothies for breakfast, but I often have them for dessert. When I want something sweet after dinner but I’m thinking something lighter, a smoothie hits the spot. This also gives me a chance to boost my system with even more fruit (and in this case veg!) benefits. Why Papaya Power Green Smoothie Recipe? 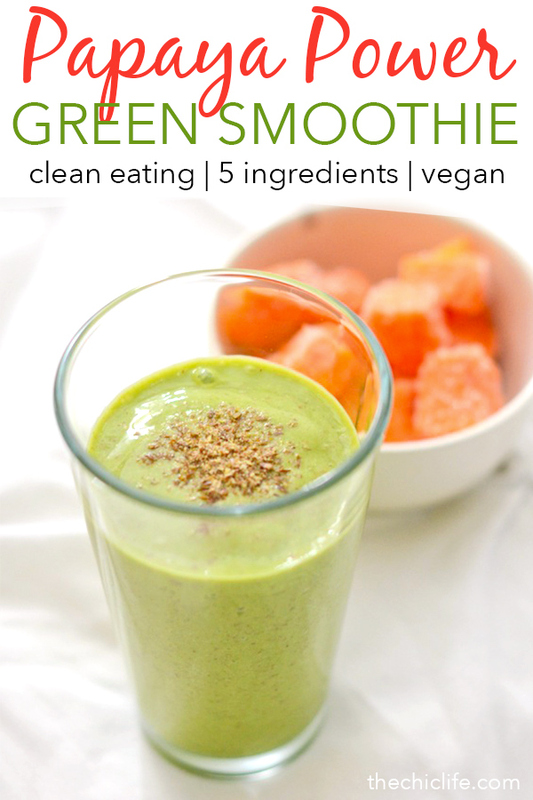 I call this a Papaya Power Green Smoothie recipe because papaya is so good for you. I’ve collected some of the best benefits below. Papaya fruit has more vitamin C than an orange, and 1 cup has 144 percent of the Recommended Dietary Allowance (RDA) of vitamin C.
The article notes papaya as also being a good source of vitamin A. Not too shabby. And the list continues! Just google for health benefits of papaya. With this recipe, you’ll also get the bonus nutrition of fresh kale and ground flaxseeds. Woop! Enjoy the many health benefits of papaya with this easy green smoothie recipe featuring papaya as the star ingredient. In a blender, add kale, papaya, almond milk, banana, flaxseed, honey/agave if using, and salt if using. Blend until ingredients are evenly mixed, about 1-2 minutes. If mixture is too thick or won’t blend, add additional almond milk (just a bit at a time) and retry blending until you get the texture you like. Taste test and blend in additional sweetener, if needed. Enjoy! 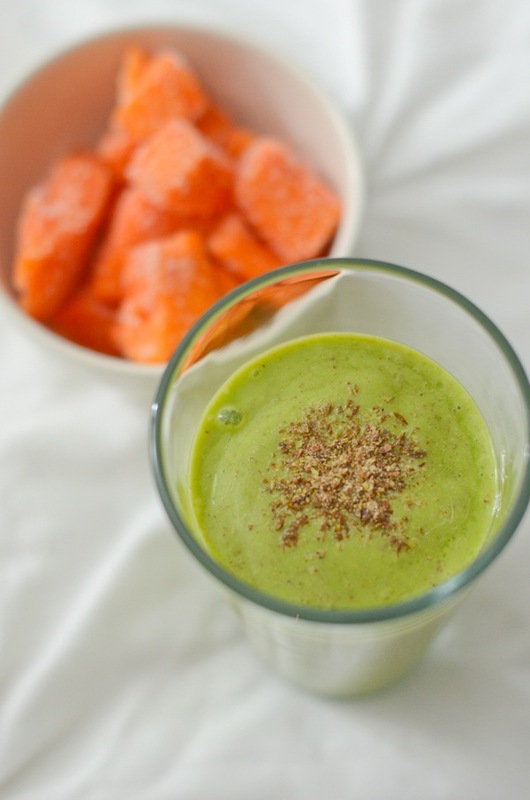 Hope you enjoy this Papaya Power Green Smoothie Recipe. I’ll have that salmon one for you soon.